Breaking down this megabank match-up by the numbers. If given the choice to invest in just one of either Bank of America (NYSE:BAC) or JPMorgan Chase (NYSE:JPM), I'd put my money on JPMorgan Chase. These are the two largest U.S. banks by assets. They're both profitable. And they're both valued at pretty cheap multiples in today's market. On the surface, they have a lot in common. But I'm still confident that JPMorgan is the better bank for long-term investors. To understand why, let's break down the three most important considerations I look for in any bank stock: risk management, profits, and value. When it comes to bank stocks, I always start with risk management. The Federal Reserve's annual stress tests are, in my view, the best source of information available to investors in this regard. In these annual exercises, called the Comprehensive Capital Analysis and Review (or CCAR for short), the Fed assesses how a bank will hold up against quantitative factors like a deteriorating labor market, changing interest rates, and stock market volatility, alongside qualitative factors like the bank's policies, processes, and infrastructure. Today, both Bank of America and JPMorgan are well capitalized and have the risk structures in place to prevent a repeat of the 2008 crisis. However, JPMorgan's results were better sooner, while Bank of America has struggled to implement the necessary risk management frameworks. Bank of America and JPMorgan Chase both passed the Fed's 2016 stress test without objection. In the Fed's most severe stress test scenario, JPMorgan's common equity tier 1 capital ratio was projected to fall to 6.8%, and Bank of America's to 7.1%. Both of these ratios are well above the required minimum of 4.5% to pass the test and an improvement from the early iterations of the stress tests. In 2012, for example, Bank of America and JPMorgan reported stressed common equity tier 1 ratios falling to 5.7% and 6.3%, respectively. As banks have improved their stress testing processes and models over the years, each has had its own struggles complying with the new requirements. Bank of America's path has come with more numerous and more significant setbacks than JPMorgan's. Last year, for example, JPMorgan and Bank of America were both required to revise and resubmit their plans before ultimately passing. The Fed was particularly vocal on B of A's shortcomings, though, calling out "weaknesses" in the bank's internal controls and "deficiencies" in its internal stress testing models. Bank of America received a conditional pass in the 2014 test, but just weeks later discovered a miscalculation that changed its capital ratios, prompting yet another resubmission and the suspension of a planned dividend and share buyback hike. At issue was about $4 billion in capital the bank thought it had, but didn't. Neither JPMorgan nor Bank of America has gone without criticism since CCAR was first implemented. It doesn't bother me if a bank is asked to revise its plan from time to time. That's to be expected for a process so complex and new. However, losing track of $4 billion in capital is a different story. With risk management out of the way, our focus can turn to profitability. And in this category, JPMorgan stands well ahead of B of A. On a trailing-12-month basis, JPMorgan's quarterly return on equity is 10.81%. Bank of America's is just 6.65%. Over the past 10 years, JPMorgan's annual net income has risen 69%. Bank of America's has fallen nearly 25%. 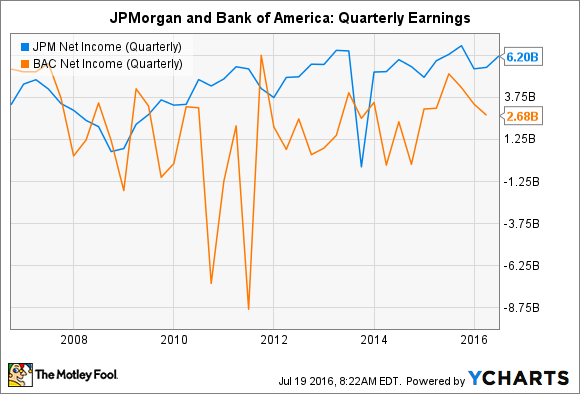 In the 2016 second quarter, Bank of America's earnings fell 18% compared to the same period last year. Its revenues were also down year over year by $1.6 billion. JPMorgan's second quarter saw revenue grow 3% over the 2015 second quarter and profits decline just 1%. JPMorgan's profits are not only larger than Bank of America's, its quarterly numbers have also been much more consistent over the past 10 years. JPM Net Income (Quarterly) data by YCharts. In this category, the contest is cut and dry. JPMorgan is more profitable than Bank of America. Over the past 10 years, Bank of America's stock is down 71% and is 74% off its all-time high. JPMorgan's stock is up 56% over the past 10 years, besting B of A but still trailing the S&P 500 by 19%. To compare the two valuations on comparable footing, we can use the price to book value ratio. 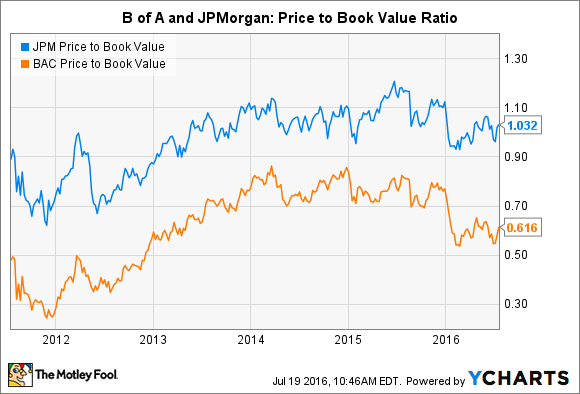 Bank of America trades at a price to book ratio of 0.61 times at the time of this writing, while JPMorgan trades at 1.0 times its book value. Typically, a price to book value ratio above 2.0 times is considered expensive, and a ratio below 1.0 times is considered cheap. By this conventional wisdom, both banks are cheap, but Bank of America is very cheap. So cheap, in fact, an investor may be tempted to buy the stock on that basis alone. Keep in mind, though, that Bank of America's price to book value ratio has not risen above 1.0 since 2008. It is cheap today, but it's been cheap for a long time and shows no signs of commanding a premium any time soon. In 1990, Warren Buffett wrote that he has "no interest in purchasing shares of a poorly managed bank at a 'cheap' price. Instead, our only interest is in buying into well-managed banks at fair prices." That wisdom rings true to me in this case. To buy a stock for the long term, an investor must be confident that a company will be able to consistently deliver results year after year. A single bad quarter is not necessarily a big deal, but a pattern of missteps and disappointments is of concern. To me, Bank of America's performance is simply not consistent enough to justify an investment at this time, even at its rock-bottom price. Over the long term, I think JPMorgan has proven itself as the better-managed, more consistent stock. It's known for its strong risk management, has better profitability, and at a valuation of just 1.0 times its book value, I think its stock is very fairly priced.